“This is my first sous chef job!” Said Isaac, brightly, as he stood on a chair before the stove, watching a pot of milk. It turns out watched pots do boil! What else have they lied to us about? Isaac and I were making paneer. Here’s how it all went down…I felt a little bad that I hadn’t spent much time cooking with Isaac. It’s nice to have something special with Malcolm, but I was worried that Isaac might feel a bit left out. So I’ve been trying to think of something fun to make that Isaac likes. I noticed that whenever we get Indian food, Isaac goes crazy for paneer, the soft, white cheese. He’ll even eat spinach, if it has paneer in it. 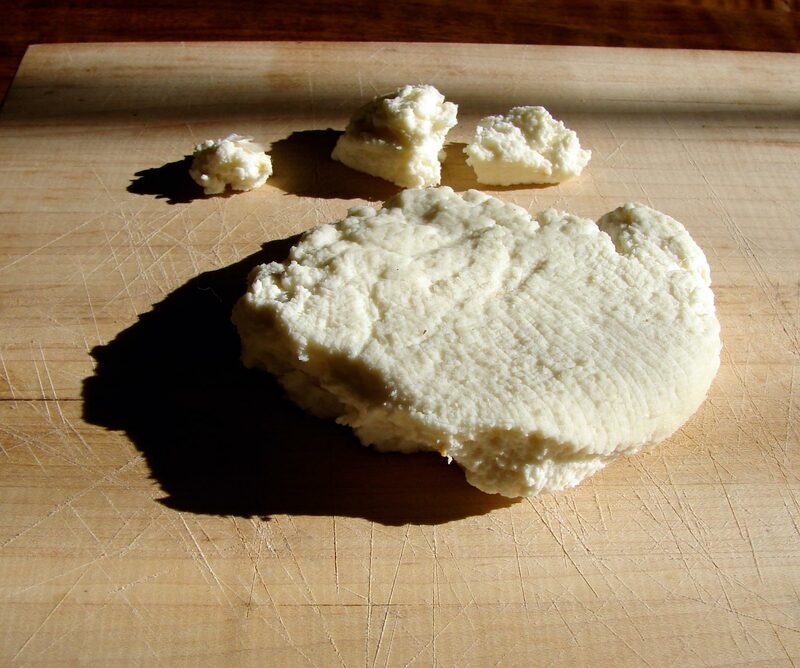 Paneer also happens to be quite fun and easy to make. So that’s how Isaac got his first job as sous chef. He made the sauce to cook the paneer in, as well. He chose all the spices, and the main ingredients, and described the taste and texture that it should have. On the way home from school, Isaac said he couldn’t wait to get home and be sous chef. Malcolm said Isaac was the sous sous chef. Isaac said, “Mommy is the over chef.” Malcolm said, “She’s the ogre chef!” I can live with that title! As you will no doubt remember, we just went to Patel’s Cash and Carry on our Super Bodega Traveling adventure, and I had some ingredients I wanted to try out! So we made a meal with lots of little dishes. Isaac’s sauce had peas and tomatoes and cashews. It was a warm, earthy sweet dish. 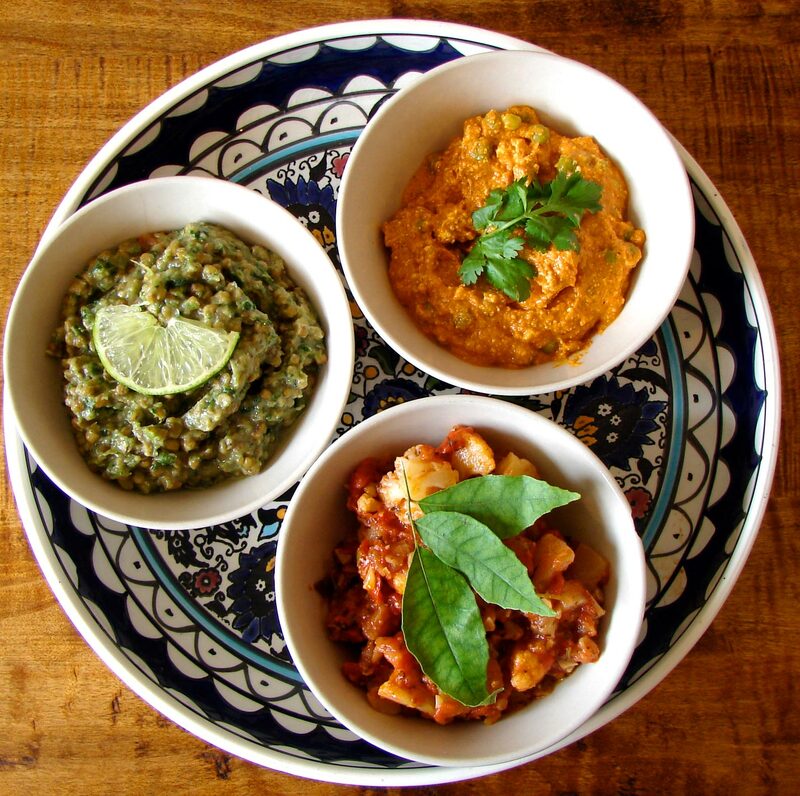 To go with that, I made a light saucy dish with punjabi tinda (baby Indian pumpkin) and cauliflower; and a very green dal, with whole moong dal, bay leaves, curry leaves, jalapeno, cilantro, lime, and ginger. I added a little black salt to this one as well – it’s a volcanic, sulfur-y salt, that adds a very distinctive flavor! Everything went very nicely together. I tried to make dosa, too, with my new urad flour. Complete and utter failure. Curses and frustration! I’ll try again, sometime, once I’ve recovered. My friend Chris is playing DJ for this post, and he suggested the perfect song (and video). As he said, it’s a saucy little number! It’s Asha Bhonsle singing a song from Jewel Thief, Baithe Hain Kya Uske Paas. Pour the cheese into a piece of cheesecloth about 1 1/2 feet long and three layers thick. Squeeze into a ball, getting out as much of the whey as possible. (You can save all of the whey for other purposes). Let the ball hang over your sink over night. I tied mine from the faucet. Because that’s what Madhur Jaffrey suggested! The next day, the curds should be quite dry. Leaving them loosely covered with cheese cloth, press them into a disk a little over an inch tall. Place something heavy on them. We used a soup pot with a big bag of masa harina inside. Leave for at least five hours. (We left it while Isaac was in school) It should be compressed to about 3/4 inches. You can now cut it into half inch cubes. Warm the olive oil in a medium saucepan. Add the shallots and garlic, and cook till they’re starting to brown. Add the cashews and tomato paste, stir and cook till the pot is dried out – a few minutes. Take off the heat and add all of the spices. Transfer to a blender. Add the tomatoes, raisins, and butter. Blend till you have a nice smooth sauce. Add a little water if you like it thinner. Add the sugar, salt and black pepper. In the same pan – cleaned and dried – warm a little more olive oil. Put the paneer in and move it about gently. Add the peas, and stir to coat with oil. Then add the sauce. Stir everything very carefully – you don’t want to break up the paneer!. When everything is warm through, serve with basmati rice. I made this in a slow cooker, because I had to leave the house. But you could easily simmer it on the stove. 1/2 inch ginger, grated or minced very fine. Pick over the moong dal, rinse well and drain. Put it in a pot with about 5 cups of water. Bring to a boil, turn the heat off, but leave the pot on the burner. Leave for an hour. In a large saucepan over medium heat, warm the oil. Add the shallot, garlic, ginger, jalapeno, curry leaves, bay leaves, and basil. Stir and cook until the shallots and garlic start to brown. Add the moong beans. Stir and cook for a few minutes, till they’re sizzly. Add the rest of the herbs and 3 cups water. Bring to a boil. Reduce heat. At this point I transferred it to a slow cooker, on high, added the butter, and cooked it 2 hours. Otherise, reduce heat, add the butter, and simmer for about 2 hours, till the lentils are quite soft, but still retain their shape. Puree the spinach and cilantro with a small amount of water. Stir this into the moong dal, along with lime juice, black salt, and regular salt and pepper. Heat till everything is warmed through, and the spinach seems cooked. Warm the olive oil in a large frying pan. Add the shallot & garlic. Cook till they start to brown. Add the cauliflower, basil and curry leaves. COok till the cauliflower starts to brown and soften. Add the spices, the tinde, and the tomatoes. Stir and then cook until the cauliflower is as soft as you like it. Fifteen minutes, maybe? Add the cilantro, lemon juice, salt and pepper. This entry was posted in beans, lentil, recipe, rice, sauce, tomatoes, Uncategorized and tagged black salt, cashew sauce, cauliflower, homemade paneer, Indian baby pumpkin, peas, spinach, tinda, whole moong dal by Claire. Bookmark the permalink. Where is Patel’s? And where do you go for Indian food? I love it too, but alas no one else in my family does. Patel’s is on route 27, I think it might be South Brunswick? The best Indian food we get is Edison. But the one right here in Lambertville is delicious, too! YUM! This looks amazing. I love paneer. When I was in India, I used to disappear off for cheeky solo palak (aka sag) paneer dinners. I dunno why, but for some reason they became a bit of a guilty secret! I may even be tempted to attempt these recipes… Lovely write-up too, Claire. Go Ogre Chef! Go Sous (Sous) Chef! I would be honored if you’d share our recipe! And Isaac will be thrilled. Thanks so much! Isaac was happy to see his name on your blog!! Thanks so much.